Offering an authentic piano sound and weighted keyboard action, the CLP series has captured the beautiful sound of Yamaha's ultimate concert grand piano - the CFIIIS. Backed by our rich heritage of acoustic piano expertise, the CLP Clavinova gracefully combines the sound and response of an acoustic instrument in a digital piano. 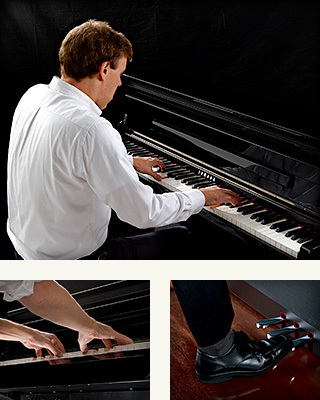 Clavinova CLP brings the exquisite sound of a Yamaha CFIIIS concert grand piano to your home or studio. Its Advanced Wave Memory (AWM) tone generation uses multiple samples from the acoustic instrument to generate every note, and its Graded Hammer keyboard gives each key a natural response. CLP models feature either the Graded Hammer 3 (GH3) or Natural Wood (NW) Keyboard which render a concert grand piano performance that is virtually indistinguishable from an acoustic grand. With a simple descrite control panel and additional classical sounds every CLP model offers an exceptional piano playing experience. With two world-renowned concert grand pianos available at the touch of a button, the CLP Series lets you choose the perfect piano tone for the music you want to play. Offering far more than just sampled sound, the CLP Series reproduces the expressive characteristics of these two unique instruments in meticulous detail. Yamaha's flagship 9' concert grand piano, the CFX offers sparkling highs and a powerful resonant bass with a sound that projects to the furthest reaches of any concert hall. 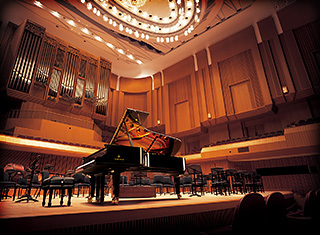 The CFX was played by the winner of the prestigious International Chopin Competition in 2010 and has since gained recognition as one of the greatest concert grands of modern times. 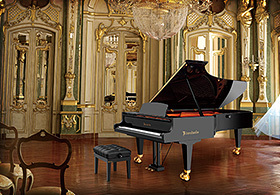 Crafted in Vienna using traditional techniques exclusive to Bösendorfer, this legendary grand piano features a characteristic warm tone known as the "Viennese Sound", perfect for playing stately melodies from composers such as Brahms and Beethoven. There is more to a great performance than sound alone; any pianist knows that playing well relies on everything from the touch of the keyboard to the feel of the pedals, and even the aesthetics of the instrument design. The CLP Series offers authentic keyboard touch and pedal feel together with a well-crafted modern design, giving you the feeling of sitting down to play at a fine grand piano. The Clavinova CLP Series utilize Yamaha's acclaimed Virtual Resonance Modeling (VRM) technology to reproduce the resonance characteristics of the strings for every note on the grand piano keyboard in nuanced detail. Featuring models equipped with the newly-developed Natural Wood X (NWX) and Graded Hammer 3X (GH3X) keyboards, the CLP Series brings a new level of realism to digital piano performance. There are even fitted counterweights for precise control when playing delicately at low volumes and an escapement mechanism that reproduces the slight click felt when the keys of a grand piano are pressed gently. Just like an acoustic grand, every key is weighted differently; keys in the bass register have a heavier feel that gets progressively lighter as you move up the keyboard. This passion for authenticity is also evident in the GP Response Damper Pedal, which constantly detects pedal pressure and return, applying them to note elongation and reverberation. The result is a dynamic range unmatched by other digital pianos in their class. The CLP Series makes practice something to look forward to with practical functions and features that make it easy to improve your performance. Train your hands with some of the most widely accepted exercises in the world using proven practice methods from Hanon, Bayer, Czerny and Burgmüller. With the CLP Series, you can use lesson functions to focus on each hand individually, or display compatible scores on your iPad using Yamaha's exclusive NoteStar application. Pick any number of high-quality rhythms, including various jazz, pop and latin patterns, to add new dimension to your performances and enhance your timing. 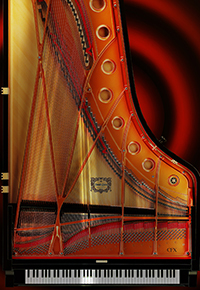 Grand piano resonance and feel in every detail, a superbly crafted keyboard that features a different weight for each key and state-of-the art physical modeling techniques.